T.E.N. and ISE® Talent work together to offer two undergraduate scholarships for the International Consortium of Minority Cybersecurity Professionals (ICMCP). 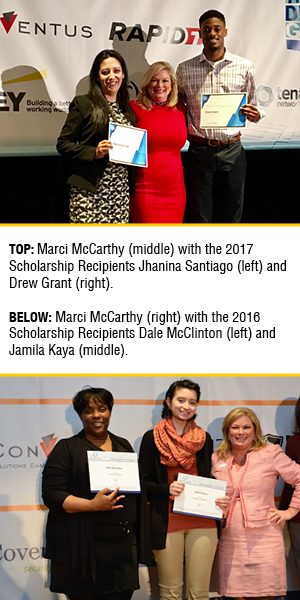 The Marci McCarthy Cybersecurity Certification Scholarship Program provides $5,000 over a two-year period to help talented women and minority students advance in cybersecurity and obtain the Security+ Certification via CompTIA. This scholarship is awarded at ICMCP’s Annual Conference to the highest achieving Female, Veteran, African American, Hispanic American, Native American, Asian Pacific, Asian Indian, or sub-Saharan African who are active ICMCP members and have demonstrated academic excellence, leadership skills, and a commitment to Science, Technology, Engineering & Math (STEM) careers to include cybersecurity, digital forensics, and information assurance. Further enhancing the congressional citation from Rep. Henry C. “Hank” Johnson, Jr. (D-GA 4th Congressional District), wherein he named March 13, 2012 as “Marci McCarthy Day,” this scholarship was created to honor Marci McCarthy’s overall work in fostering greater professionalism in the IT security industry in an effort to advance cyberspace protection in the private and public sectors. Please CALL (770) 331-1805 or EMAIL US for more information. ISE® Talent is an executive search and talent management firm dedicated exclusively to Information Security Executives. A 100% woman-owned business, ISE® Talent is a division of T.E.N., the leading national technology and security executive networking firm that facilitates peer-to-peer relationships between top executives, industry visionaries and solution providers. Learn more about our parent company by visiting www.ten-inc.com. Copyright © 2016 ISE® Talent, a T.E.N. Company.